It’s time to show two more pieces for my halloween costume: a third (a final) skirt and a chemise. 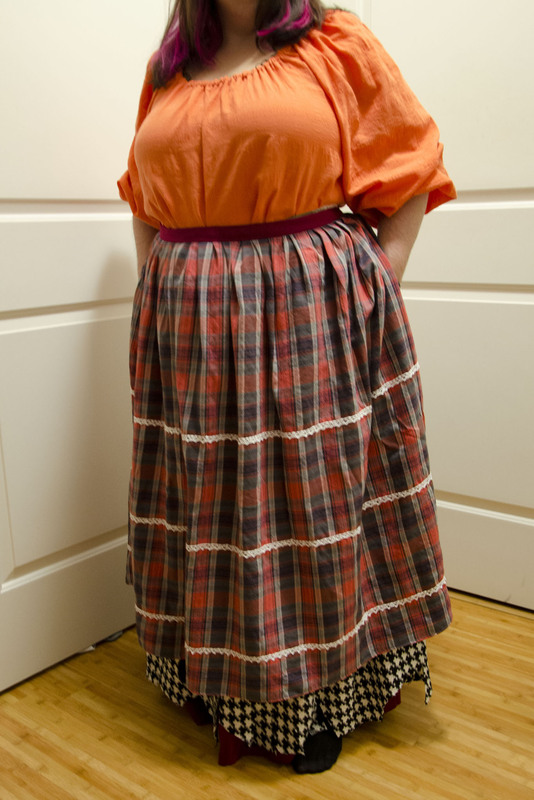 The skirt is made in the same manner as the petticoat, although I used self-fabric ties for the front because I ran out of twill tape. 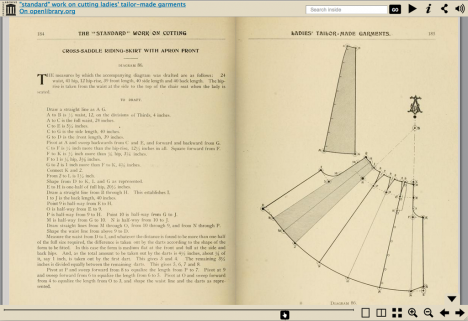 This time the fabric was wide enough to use the selvedges along the side seam, and the skirt is supposed to be short, so two yards did the work. The plaid fabric wasn’t quite right, so I topstitched lace in a few places before constructing the skirt. 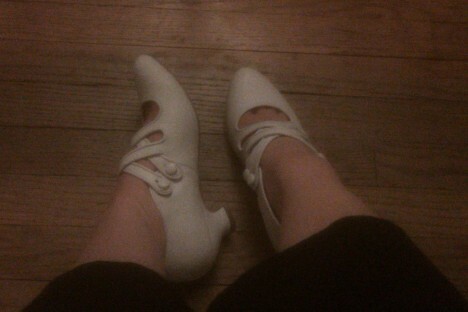 It’s still not very close to the original fabric, but it’ll do for a costume. The chemise was made using Simplicity 5582. Because there is an incredible amount of ease built into the pattern I didn’t bother with any sort of bust adjustment or other fitting since the ease would leave plenty of room. 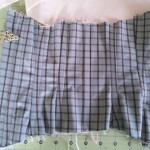 I did add an additional 7.5″ to the length, though, to change it from a blouse into a knee-length chemise. It’s very much costume construction with pinked seam allowances and elastic at the arms and necklines, but done is better than unfinished couture. One costume-specific detail is the attached necklace (made from a 30″ chain from the jewelry section at the big-box craft store). Although source photos show it is definitely attached, none are clear as to how. 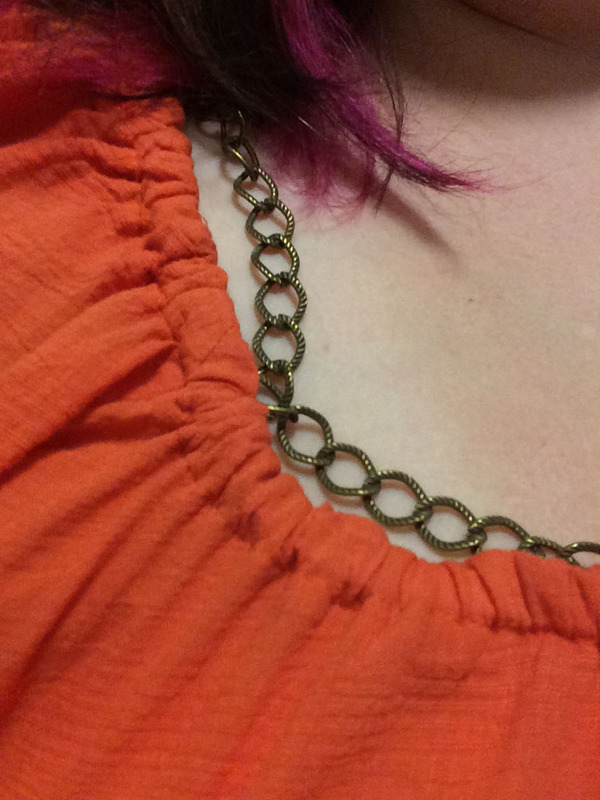 I decided to use hooks (of hook and eye fame) sewn to the neckline elastic casing to catch the links of the chain. 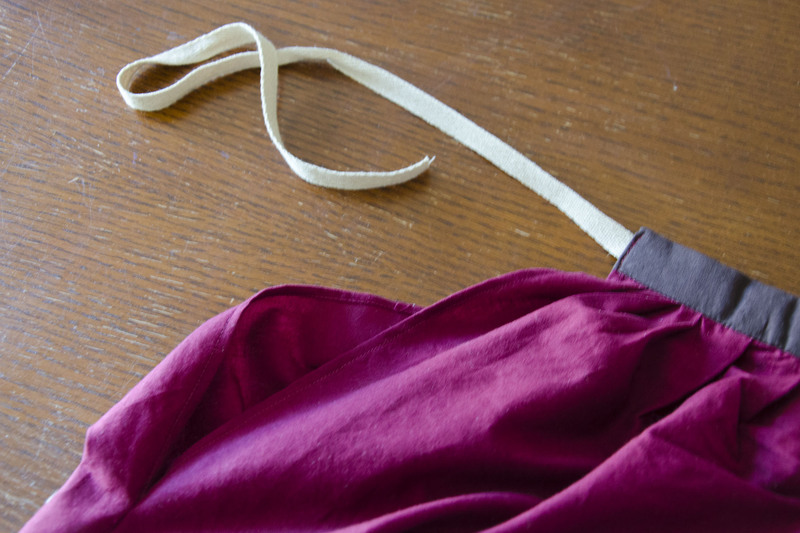 Then, it’s easily removable if I want to repurpose the chemise, but will stay in place while I’m wearing the costume. 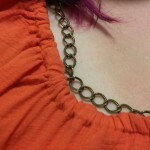 The tension from the short length of the chain keeps it from falling below the neckline. 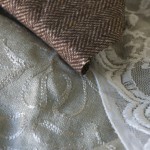 Stay tuned for later this week when I can reveal the final pieces. I’m doing a group costume for Halloween with two of my coworkers. The who I’m portraying is a secret until then, but the how involves three different skirts for maximum authenticity. This is layer one. The character is historical, but we’re not going for historical accuracy (nor did the original costume designer). This petticoat is almost-historical, albeit for about 100 years later than the character’s base time period. 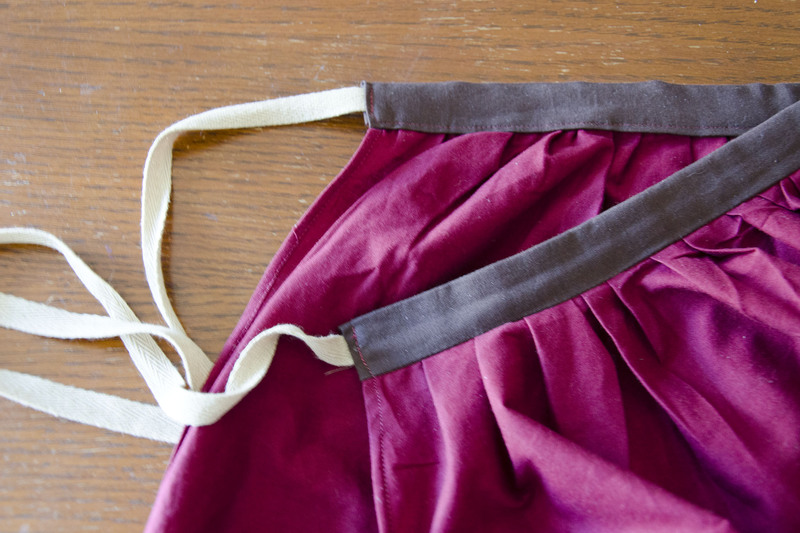 It’s made from 3 yards of 44″-wide cotton, plus stash scraps and twill tape for the waistband. 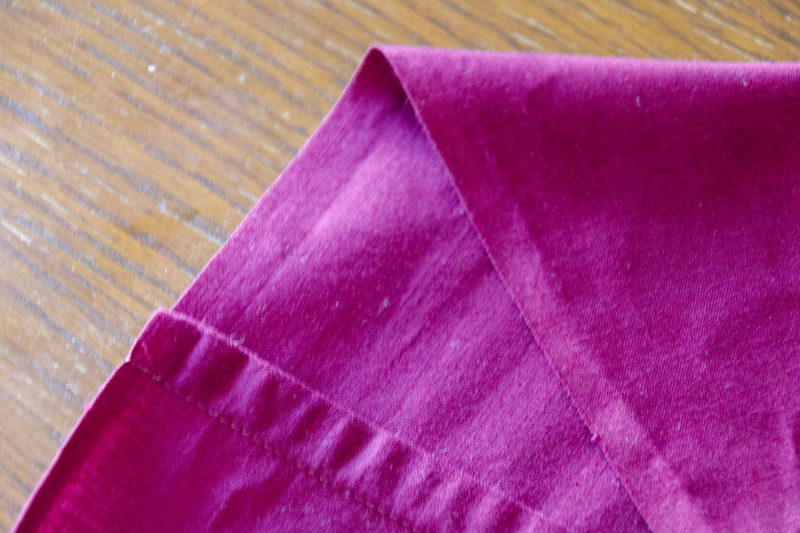 The hem is approximately 106″, so nicely full and swishy. 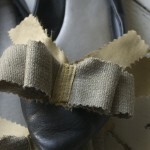 I used my rolled-hem foot to finish off the side slits, then sewed the rest of the side seam with a french seam. 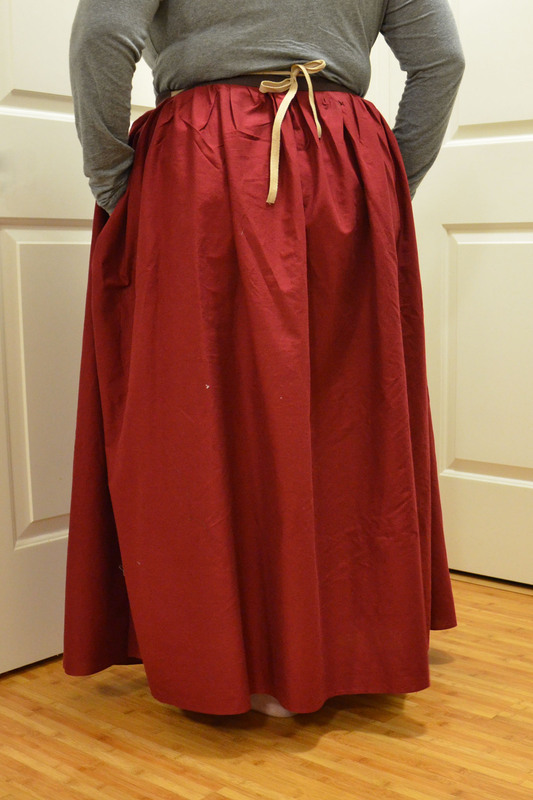 Those techniques are not historically accurate at all (well, maybe the narrow hem, a little). At 5’3″ with a short inseam, the 44″ width was the perfect height for me, so I used the selvage as a hem, which made the work very quick. 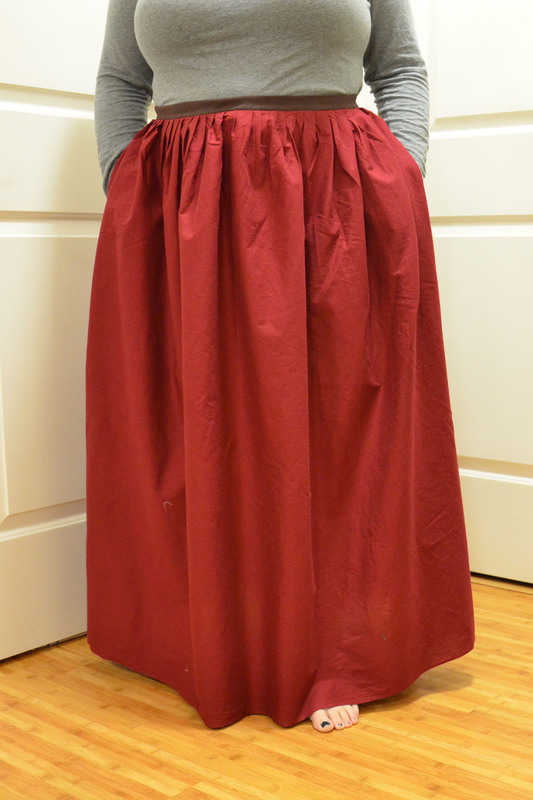 A more historically accurate skirt would have put the selvages along the side seam, but the fabric width was too narrow for the fullness I wanted, and I didn’t want to sew any additional seams. 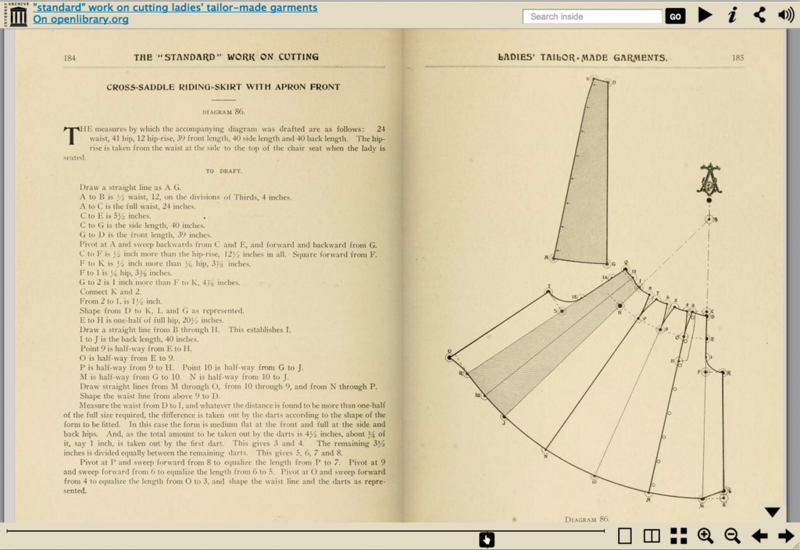 Selvage hem and french seams made construction quick with little chance of raveling. 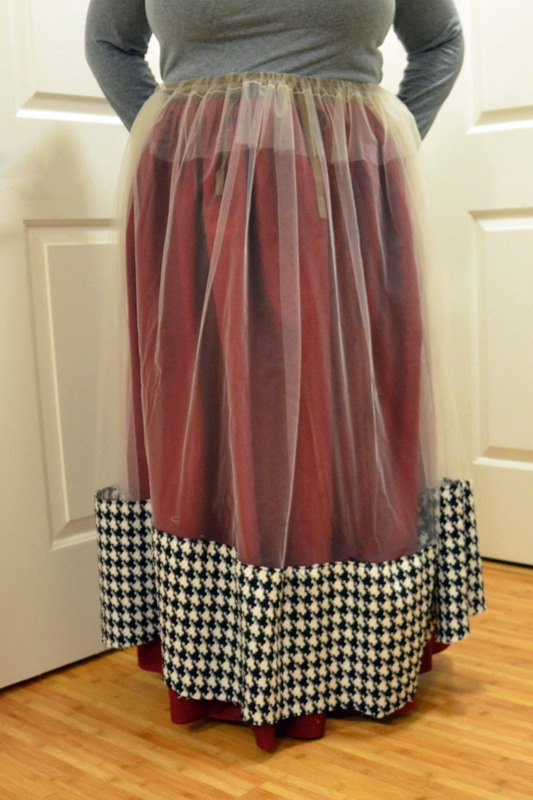 Thanks to American Duchess for a great tutorial on this style of petticoat making. 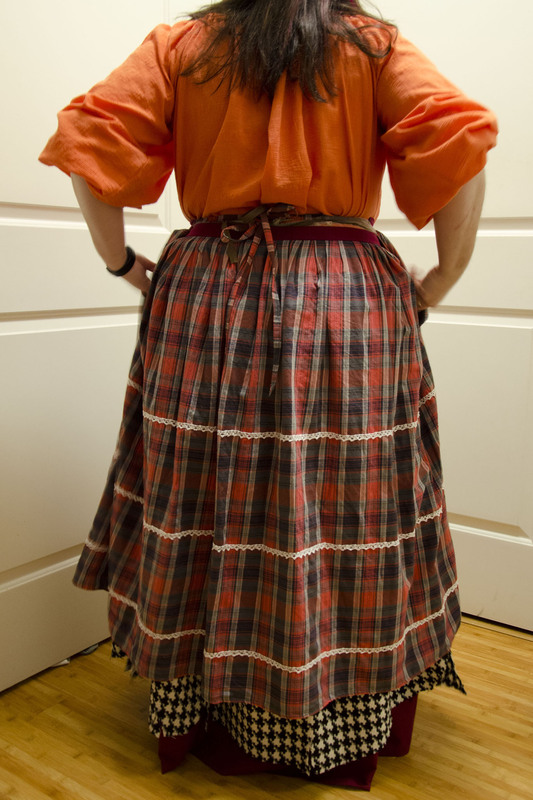 My pleats were rather haphazard, but they work just fine, and the double waistband makes fitting adjustments a breeze. I also finished the sewing part of layer two, although it needs to be thoroughly distressed before it’s technically complete. This layer is far more costume construction than historical, using a half yard of the fashion fabric, with tulle for the rest, which will be hidden by the overskirt. 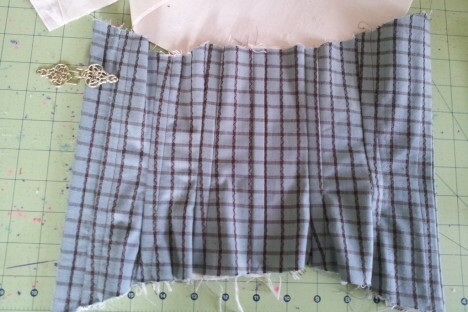 The same two-part waistband structure is there, but I sewed a channel for the ties and gathered the center by way of stringing the bias tape through, then tacking the ends so it doesn’t spread out again. 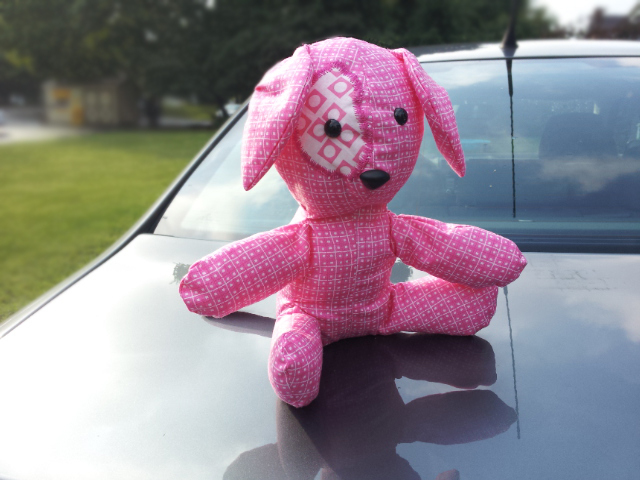 It’d be a bit unwieldy for cotton, but works well for the light-weight net. The hem (or lack thereof) will be even more uneven by the time it’s fully distressed. I’ll try to post more progress posts before Halloween, if I can do so without plot spoilers. Otherwise, you’ll just have to wait until November! 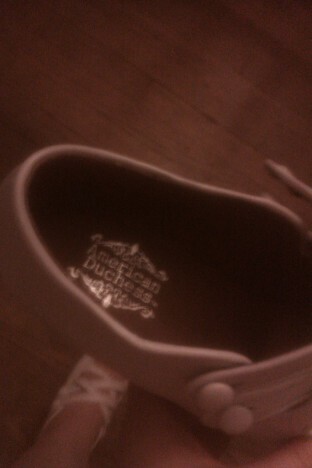 It’s my pair of American Duchess Astorias, a shoe modeled after extant Edwardian-era shoes! Mine are a lovely, dyeable ivory, but they also come in black. They fit quite well, and are very comfortable, at least from the bit of prancing about the house I did. 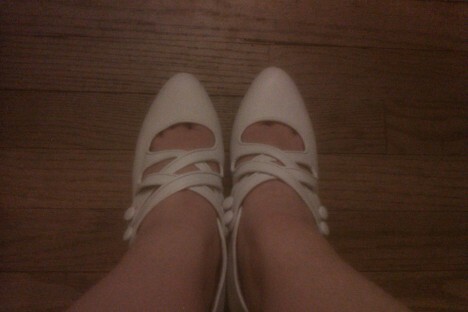 I don’t consider myself to have narrow feet, but actually, for shoes made on dance lasts, these are almost too wide (but just a comfy wide, not actually too wide). 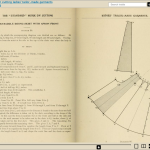 …so that the front measurement (line C-G) was the right length for my models, it worked out that the waist was also right (in other words, the measurements I needed to draft to are pretty much correctly proportioned to the book’s draft). Since I first posted about making the Steampunk costume, my plan has changed a small bit, but also really coalesced into something I think will be great when it is finished. What is helping me stay focused and not go too far out there (or grow this into something too large) is to focus on a couple themes. If an idea doesn’t suit the themes, then it’s taken off the table. 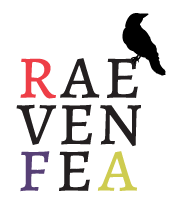 I think head-in-the-clouds Rae has won out (was there ever a question, really?). I’m making a Steampunk costume over the course of the next nine months. 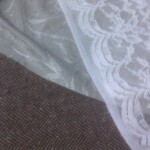 I even ordered some fabric, so now I have to make it. My muse hasn’t stopped singing about the costume in the past week. It came up with a whole backstory and character for this costume, and who am I to deny it? Now that it’s in my head, I can’t get past the character (who is about 18 years old) so this won’t be a costume for me. Luckily, I have two younger sisters with similar body types (to each other, not me. Brats got all the tall genes)—hereafter referred to as C&K—to exploit, and they’ve agreed to let me dress them up at Christmas for a photo shoot. So, paired with their measurements, a dress form I don’t yet own, and only a single chance to fit a mockup or two in person in less than a month (unless they come visit me, which is doubtful, since they’re on college-student budgets and I’m on a recently-bought-a-house-and-am-making-a-big-costume budget), I will be creating a costume that fits them (in theory). Luckily, they have more pattern-ready bodies, so fitting should be simpler than if I were to make it for myself, I think. I had hoped to be further along with my dress by now (that is, started), so that this giveaway could tie into notes about making the dress. 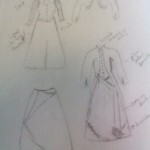 However, I want to make sure that you have time to make your own dress for the show or whatever events you wish it for. 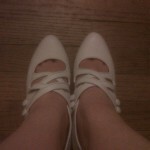 So, without further ado, this is a giveaway! Of Simplicity’s licensed Sense and Sensibility Regency Gown—perfect for 1812 Bicentennial celebrations! 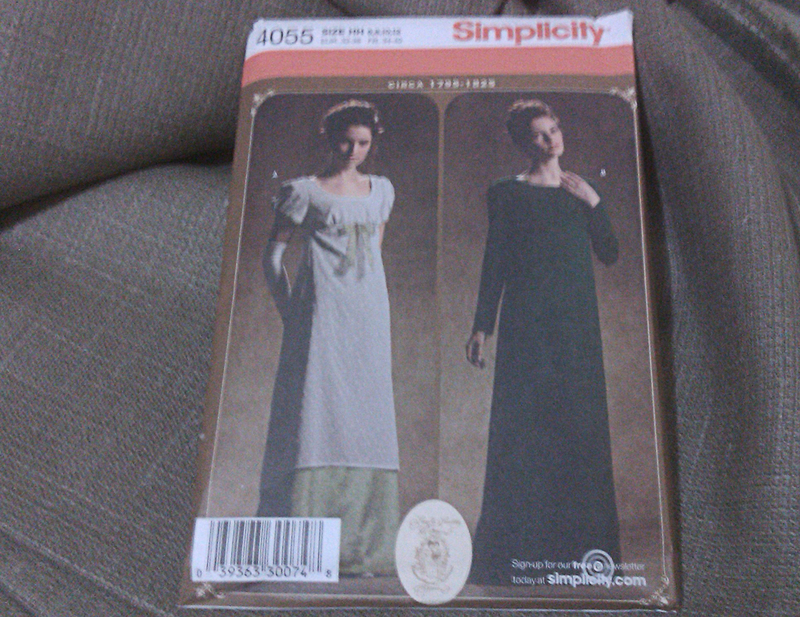 The background of the photo is the fabric I might be using for my own dress… a green wool. 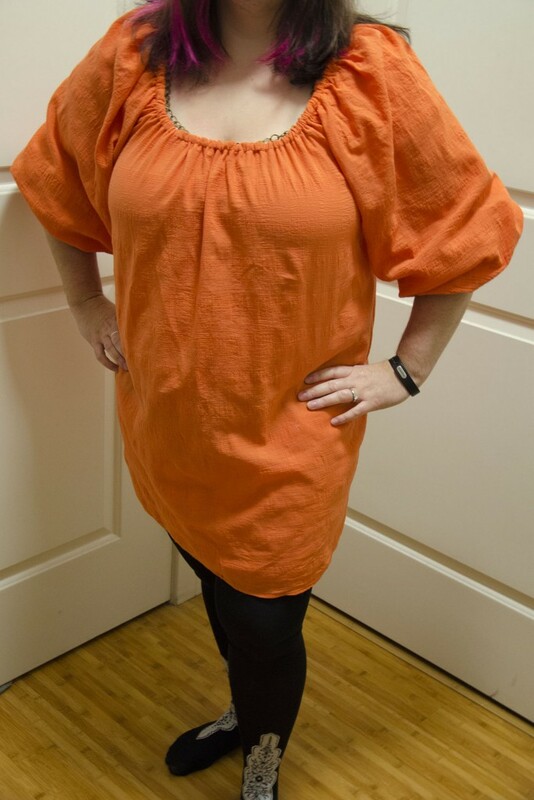 Specifically, this is the size HH (6-8-10-12) pattern, so you need measurements smaller than 34-26-36 according to the package, although considering the modern ease added, you may be able to get away with using the size 12 even if you are closer to 36-28-38 (what they consider size 14), and if you’re really adventurous, you can try to scale the pattern up.